Published on September 29, 2008 in Guy Sherwin. 0 Comments Tags: Brisbane, expanded cinema, Guy Sherwin. 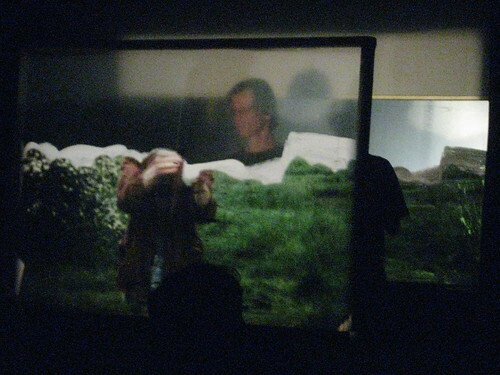 above: Guy Sherwin performs “Paper Landscape” in Brisbane during his recent screenings. The TLC’s Louise and Lucas, joined by Sydney film maven Mike Leggett, recently made the trip to Brisbane to see Guy Sherwin and Lynn Loo do their thing at the IMA. Guy and Lynn’s trip was courtesy of the Brisbane Film Festival and our friends at Otherfilm. It was totally worth the journey! Some more pictures from our adventure here.